You can listen to these MP3 streams using, e.g., WinAmp or RealPlayer Basic Both are free. This resource is provided for the public by members of the MSFC Engineering Directorate. On a typical day, when there's no intense meteor shower, radar listeners will hear about one ping per minute or so. Rates could become substantially higher during a meteor shower. The best time to listen is always during the hours around dawn (0800 - 1400 UT) in Huntsville, AL, where the radar is located. Rob Suggs, Bill Cooke and Jeff Anderson of the Marshall Space Flight Center Engineering Directorate have constructed an experimental "meteor radar" in Huntsville, AL, to monitor near-Earth meteoroid activity above the southeastern United States. As meteoroids plunge through Earth's atmosphere they disintegrate at an altitude of 80 to 130 km. The fiery trails they leave behind are full of ionized gases that reflect radio waves. Amateur radio operators routinely use a layer of Earth's atmosphere called the ionosphere (which is ionized by solar ultraviolet radiation) to bounce shortwave signals over the horizon for long distance communications. Disintegrating meteoroids create a short-lived mini-ionosphere that disappears as electron and ions in the trail can recombine to form neutral molecules. But for a few seconds distant radio signals can bounce off the meteor trail, giving rise to a radar-like "ping" in receivers below. A typical echo sounds like this. By counting such echoes, scientists can estimate the number of tiny meteoroids in the vicinity of our planet. 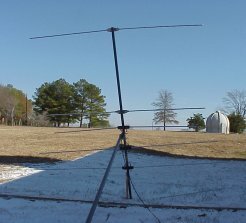 The MSFC meteor radar is tuned to 67.25 MHz, which allows the system to record echoes from an array of Channel 4 TV transmitters around the southeastern USA. All of the transmitters are over the horizon as viewed from the Marshall Space Flight Center, so it is normally impossible to detect them. But when a meteor races by, the distant TV signals bounce off the ionized meteor trail and down onto the MSFC antenna. "The antenna we use [pictured left] is a 6-element Yagi; it is a commercially available cut-to-frequency channel 4 TV antenna sitting on the ground and pointed straight up," says Dr. Rob Suggs of the MSFC Engineering Directorate. "We use the CW demodulator on our Icom PCR-1000 so that 67.250 MHz (channel 4 zero offset) appears at about 700 Hz. This also inverts the passband so that the doppler shift of meteor echoes is reversed (frequency increases rather than decreases to the 'zero' frequency of the trail echo). The filter is set to 3 kHz bandwidth and the AGC is turned off." "The closest transmitters on this frequency are in Dothan, AL, Charleston, SC, Oak Hill, WV, Little Rock, AR, and Kansas City, MO," he continued. "The map, below, shows local Channel 4 zero offset TV transmitters with a circle around each showing the areas they illuminate down to an altitude of 100 km (typical meteor altitude). Although the transmitters are over the horizon for our station on the ground, a meteor at 100 km over us has a direct line of sight. The scattering geometry is tricky, that's why we frequently see a meteor visually but don't hear any echo from it." Radio meteor rates are usually highest near dawn and lowest near dusk. That's because the dawn sky is moving directly into the swarm of space dust surrounding our planet. Just as bugs splatter on the front windshield of a moving car, but not on the rear windshield, lots of meteoroids hit the dawn sky, but very few can catch up with the sky at dusk. Above: The rate of meteor activity is usually greatest near dawn because the earth's orbital motion is in the direction of the dawn terminator. Earth scoops up meteoroids on the dawn side of the planet and outruns them on the dusk side.